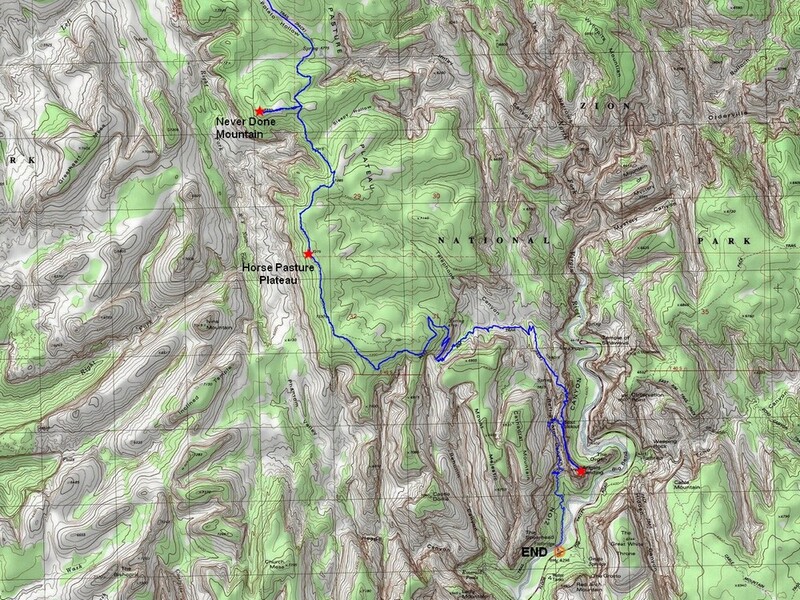 The West Rim Trail is considered a classic backcountry trail in Zion National Park. The trail starts near Lava Point, which is the highest point in Zion. The endpoint is at the Grotto trailhead, down in Zion Canyon. A side trip to climb Angels Landing is highly recommended. 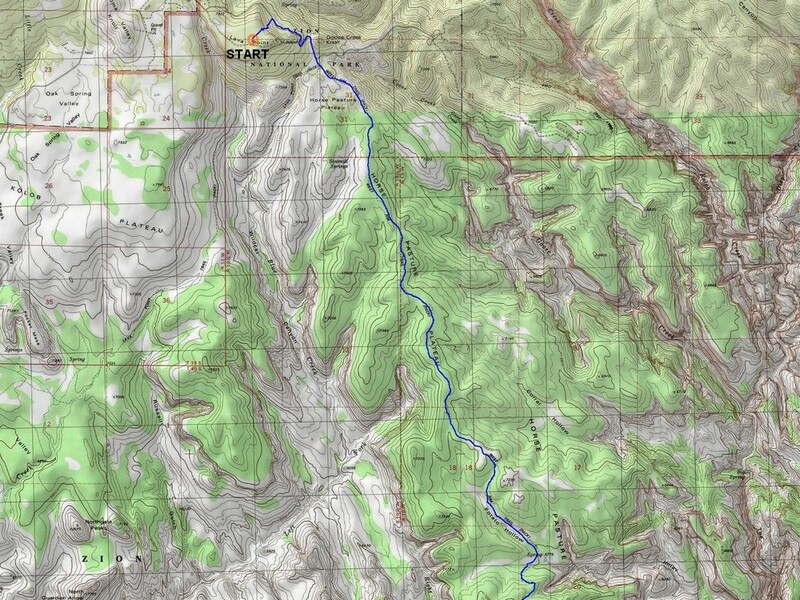 The 18 mile trail can be done as an overnight backpacking trip, or a long day hike. If starting from Raven Point, it is mostly downhill with only about 2000’ elevation gain, but the distance still makes this hike fairly strenuous. I camped near Kolob Terrace Road the night before, and then drove to Zion Adventure Company in Springdale to catch a $39 shuttle ride to Raven Point. (Reserve in advance.) The snow hadn’t been gone long from Raven Point, and the driver informed me I was lucky we’d made it all the way to the campground. After hiking Barney’s Trail for a mile from the campground down to the West Rim Trailhead, I was now on the main trail. The first several miles down to Potato Hollow were pretty mellow. It was a nice area, but nothing jaw dropping. The trail then hit its first significant uphill section, and I soon reached a saddle east of “Never Done Mountain” (Peak 7370’). I left the trail here, and headed cross-country west to top of this little peak. The mountain itself wasn’t overly impressive, but the views definitely were! From there I could see the Guardian Angel peaks, and tons of amazing and dramatic Zion-esc scenery. It was a great spot to eat a PB&J and soak in the view. Once back at the trail after leaving Never Done Mountain, the views kept getting better and better. I’d been hiking quickly the first 7 miles, but my pace slowed considerably now as I stopped regularly to soak in the views. The trail headed downhill in earnest after crossing the highpoint of Horse Pasture Plateau (Peak 7375’). It wasn’t long before the trail dropped steeply down into Telephone Canyon, which was very impressive all on its own. The trail then climbed a brief uphill section before beginning the descent toward Refrigerator Canyon. Soon enough, Angels Landing came into view. What a piece of rock! I had been eagerly looking forward to climbing Angels Landing, even with the crowds that had hiked up from the Grotto. There were groups of people resting at Scouts Lookout, but I hustled past them to begin the climb. I had heard there was exposure on the route, but was surprised just how dramatic it was, even with chains to hold onto in riskier sections. The route definitely had my full attention. Even with occasional stops to let descending groups get past, I still made a quick and excited pace up the “trail”. Once on the summit, the views were fantastic, and the exposure was amazing. But even with a dozen or so other folks on the highpoint, there was still enough room to sit down for a snack before making the descent. I was very careful on the way down, with regular stops to let other ascending groups pass. Definitely a very memorable route. Once back at the main trail, it was a very pretty descent down the famous Walter’s Wiggles switchbacks, and eventually down to the Grotto trailhead in Zion Canyon, where I caught the shuttle bus back to Springdale. What a great day of hiking. Some amazing scenery along the trail, and Angels Landing was a blast. The hike amounted to 18 miles, 2000’ elevation gain, in just over 7 hours. Cool mix of plant life early in the hike. Plentiful cactus on the way to Never Done Mountain. Nearing the summit of Never Done Mountain. Never Done Mountain summit view looking south. Great views from the West Rim Trail. Highpoint of Horse Pasture Plateau. The views keep getting better and better. Trail descending into Telephone Canyon. The west rim is up there somewhere. First view of Angels Landing. Wow. Caution sign at the start of the Angels Landing climb. Start of the Angels Landing climb. Starting to feel the exposure! Heading up the spine of Angels Landing. Looking back on the Angels Landing approach. 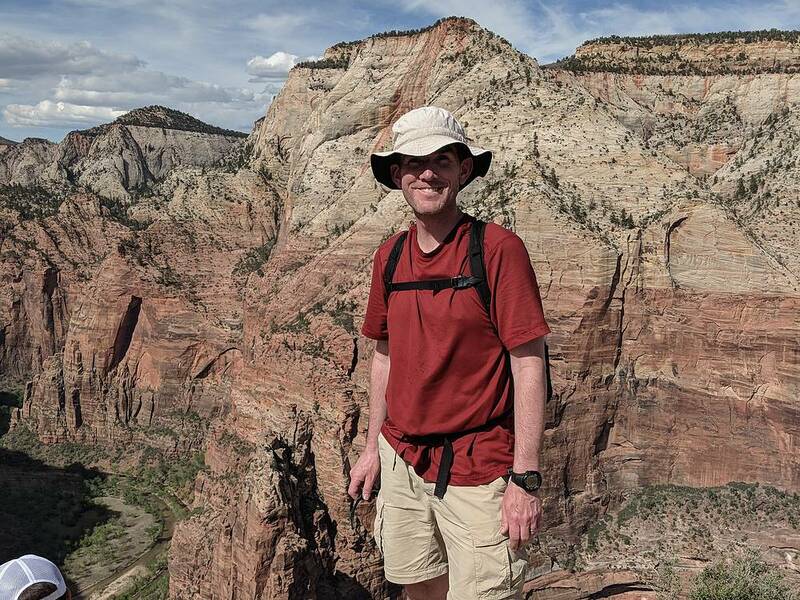 Me on the summit of Angels Landing. Angels Landing summit view north, Virgin River. Headed down the steep Walters Wiggles switchbacks. Grotto Trailhead, Virgin River, Zion Canyon. Map of the northern part of the route.Map of the southern part of the route.Barneys Trail starting point.West Rim Trailhead signage.Cool mix of plant life early in the hike.Plentiful cactus on the way to Never Done Mountain.Nearing the summit of Never Done Mountain.Never Done Mountain summit view looking south.West Rim Trail.Great views from the West Rim Trail.Highpoint of Horse Pasture Plateau.The views keep getting better and better.Cool mesa.Trail descending into Telephone Canyon.The west rim is up there somewhere.Telephone Canyon scenery.More Telephone Canyon scenery.First view of Angels Landing. Wow.Caution sign at the start of the Angels Landing climb.Start of the Angels Landing climb.Angels Landing chain assist.Starting to feel the exposure!Heading up the spine of Angels Landing.Looking back on the Angels Landing approach.Me on the summit of Angels Landing.Angels Landing summit view north, Virgin River.Headed down the steep Walters Wiggles switchbacks.Refrigerator Canyon.More switchbacks to descend.Grotto Trailhead, Virgin River, Zion Canyon.